I still ride about three times a week, and have to say that I still love everything about it: the earthy goodness of the way horses smell; the routine of getting the horse and rider ready; the complicity between horse and rider… I love it all. I do have to admit that every time I ride I am scared witless (this due to a few too many falls, a lot of physical therapy and jumps which scare the bejeezus out of me), but I don’t think it’s a bad thing to frequently do at least one thing that scares you. And when it’s good, its so so good: in the spring, outside, when there are no tractors to distract either the horse or the rider, and its warm enough but not too warm… it’s one of my favorite ways to start the day. I suppose then that it’s no surprise that any poster that features equines is a poster I need to have. Whether it’s a streamlined horse and red-jacketed rider in an Art Deco poster by Charles Lemmel, or an unsigned poster with a lovely mare and stallion from the 1937 races at Cavaillon, just about any poster which has a horse is a poster which hangs with pride either at home or in the gallery. 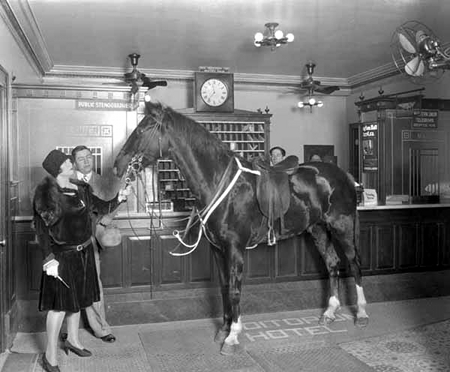 Horses have often been used in advertising when marketers wanted to appeal to an upper-class audience, or more likely, when they wanted to add a certain level of class to a product which perhaps didn’t have any. Artists like Ludwig Hohlwein used equines to sell shoe polish, cigarettes, tailored clothing and just about anything else he could think of …. Hohlwein actually produced a large body of work that featured horses – racing, jumping, cavorting – and although some of these pieces are quite small (2 inches x 2 inches), they are spectacular, striking and stupendous. Teatro Gianduja - Look at that smile! 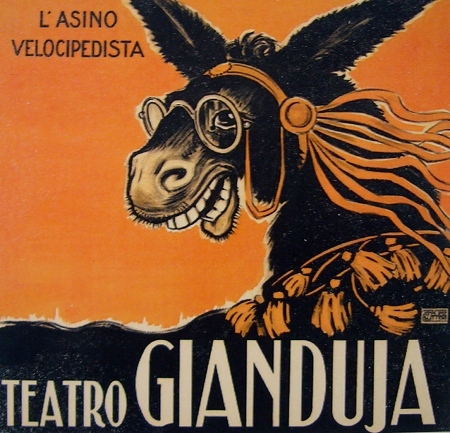 If the image is to be believed, at the Teatro Gianduja (which was, I think, in Como near the Lake in Como, Italy), this good-looking donkey (asino) rode a bicycle (velo) in a touring show. I don’t know if I like the ribbons more than the glasses, or the fact that he looks like he’s smiling, but this was one of the first posters I bought when I opened the gallery. Although I know he went to a good home, I miss my goofy donkey-guy…. Previous What do the Tour de France, the Giro D’Italia and a Gladiator have in common?